Drip irrigation is used to extend water, growing crops in countries around the world now. Here in Baja California, and much of the rest of Mexico, literally miles of drip irrigation tape (hose) are discarded every year on the many farms using well water,....the tape having lost it's usefulness because of being clogged up or having leaks in it. 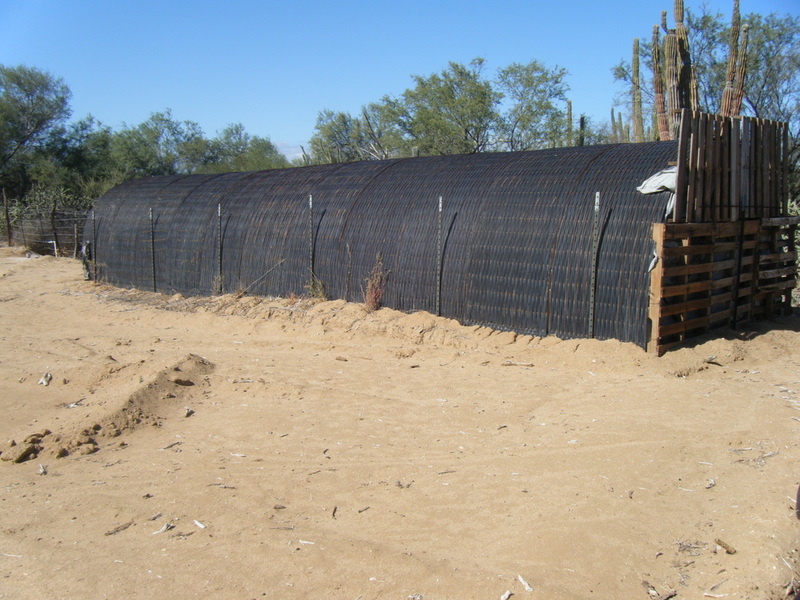 Here at the ranch,we've invented a way to make use of this resource by weaving the tape into heavy steel mesh panels, making a material for walls and roofs that can be painted over. Small spaces are left between rows of the tape. Moderate amounts of light and air pass through these openings in the panels, when left unplastered, or they can be plastered to make a solid surface out of them. Other items have been made using the drip tape, such as purses, & jackets, sewn together, and furniture & shades. Given the earth's increase in human population and the drought conditions commonly seen worldwide, water will have to be used very wisely to insure all peoples can be fed. Drip tape will be used in ever increasing amounts on farms and thus will be available for use in building. The weaving we do under a shade tree one tape at a time. It's very easy work and can be done by almost anyone. The panels are lightweight, flexible, and strong. Buildings go together quick and require little in terms of foundation. We have drip tape here at the ranch that has been in the sun for over 20 years and it hasn't gotten brittle yet. The life span of the plastic tape is quite long in direct sun because of the u.v. inhibitors used in the plastic and, obviously, much more so covered with plaster. This material holds much potential for providing housing in short order. The arch structure in the photo below took 4 people 3 hours to erect, once the panels were woven. A family can be under roof, private, out of the direct sun, in a structure that breaths and enjoys reduced light in a very short while, using simple low cost tools to put it together, while using discarded water hose, reducing the load on landfills.